If you are looking for my Sparkle Creations January Day 1 Preview, please click HERE or scroll down.. Thanks! Hello! After taking a bit of a break, it's JustRite Friday Challenge time again! This week's challenge, JRC_046, is sponsored by Scor-Pal and is a technique challenge (use some kind of scoring on your project). Scor-Pal is generously donating Scor-Buddies as prizes! I'm going to warn you in advance.. my post is full of photos today, so please bear with me! I am showing you a set of cards and highlighting 3 new JustRite cling sets. I found a set of 8 notecards and envelopes in the dollar bin at Michael's and decided to re-purpose them and make some thank you cards for Sabrina to send out (since she was quite spoiled during Christmas). 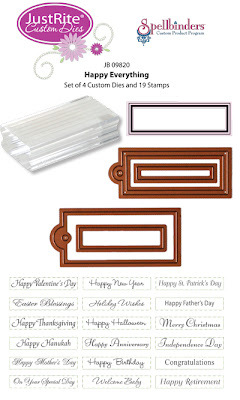 This would also make a great set of monogrammed cards! Below is what the cards looked like when I bought them.. 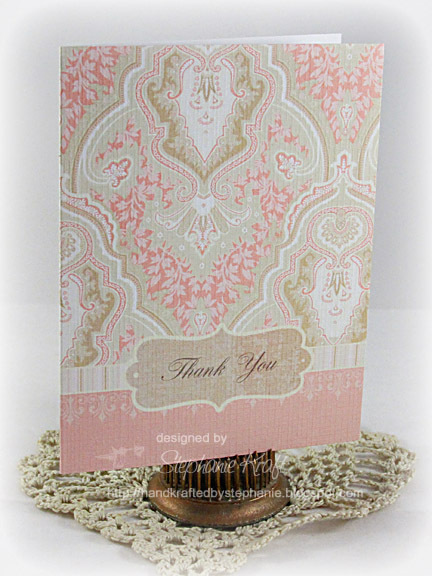 I loved the soft, feminine color palette, which is what caught my eye to begin with. Here's my first card... I trimmed the front, matted it onto Kraft cardstock and added some stitching. Next I added some embossing around the edges of my card base with the Scor-Bug embosser and popped the panel with foam tape. 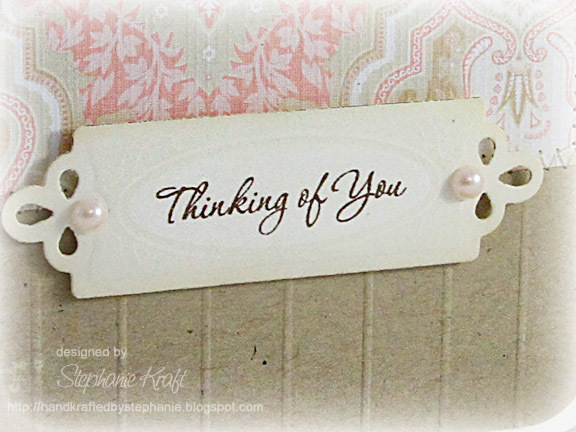 To create my sentiment panel, I clear embossed the frame (from CL-02080 Fancy Tags Set - Cling) onto Kraft cardstock. The tag was cut out using custom dies (co-branded with Spellbinders and JustRite) from the JB-09820 Happy Everything set. The sentiment is also from Fancy Tags. I added a bit of Divine Twine to the tag and popped all the layers. For my second card (below), I also trimmed and matted onto Kraft cardstock and added some zig zag stitching around. I added a couple score lines to the bottom of the panel with my Scor-Buddy. To create my sentiment layers, I clear embossed the smaller frame from CL-02070 Fancy Frames Set - Cling onto Kraft cardstock. 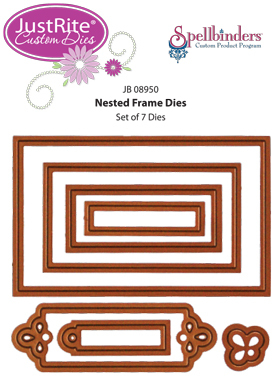 I die cut the frame using the custom JB-08955 Nested Sentiments Die. The center of the frame fits Spellbinders Labels Fourteen (2nd smallest die) perfectly, so I die cut and stamped Thank You (also from Fancy Frames) onto it and popped it on top of the frame. For card 3 (below), I used my Scor-Pal to add some lattice scoring directly onto my patterned front, matted it onto Kraft cardstock again and added some crazy stitching around. 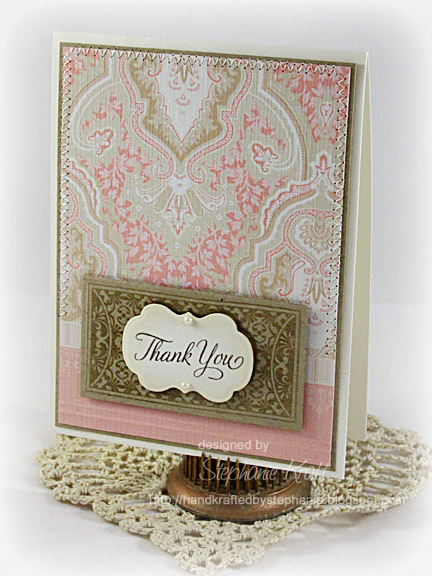 I clear embossed the fancy frame from CL-02075 You Inspire Me - Cling and cut it out using Spellbinders Labels Five. 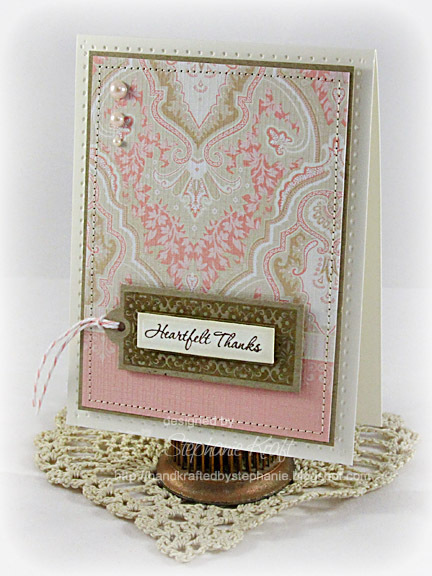 I stamped Thanks and die cut the oval using Spellbinders Petite Oval Nestabilities - SM (smallest die). My final card (below) uses just the top portion of the original card front. I matted it onto Kraft cardstock, added some vertical score lines on the bottom and again added some zig zag stitching. I also rounded the bottom corners to soften the card up a bit. 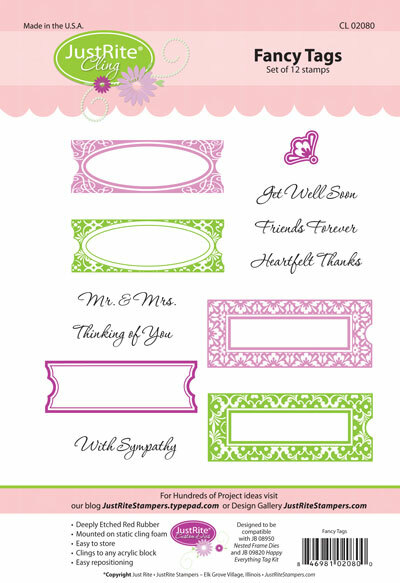 Dies & Punches: JB-09820 Happy Everything, JB-08955 Nested Sentiments Die, Spellbinders Labels Fourteen (die 2), Labels Five (die 4), Zutter Round-It-All. Accessories: Scor-Pal, Scor-Buddy, Scor-Bug embosser (Scor-Pal); Divine Twine, Basic Grey Pearls, Foam tape, Thread, Sewing machine. 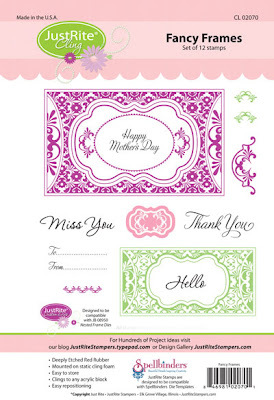 love the sof pink and Kraft combo. I've to get this Fancy tag set..fabulous!! Stephanie - these are just fabulous. 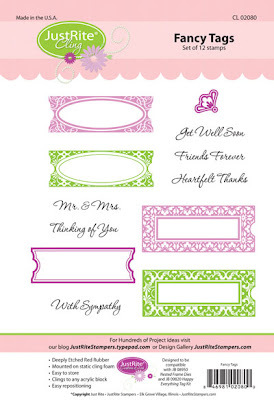 I love how you've altered the preprinted notelets and made a much nicer set of thanks notelets. All very feminine and so pretty. Love them! wow- zers girl, all your cards are so pretty and elegant! What a beautiful way to breathe life into your dollar bin find!! Love how you used the scor-pal in different ways and gave different effects! Gorgeous Stephanie!!! 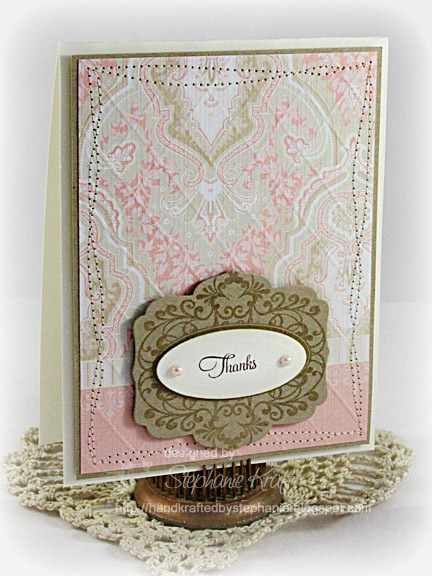 Stephanie, I love the way you re-purposed this set of cards. They look great with the new JustRite stamps and dies. Wonderful job! Wow! I love your repurposed cards, very pretty colors and you made them even better! Great showcase of how different scoring can add so much to a card. I also like the clear embossing of the fancy frames on Kraft cs, very pretty. 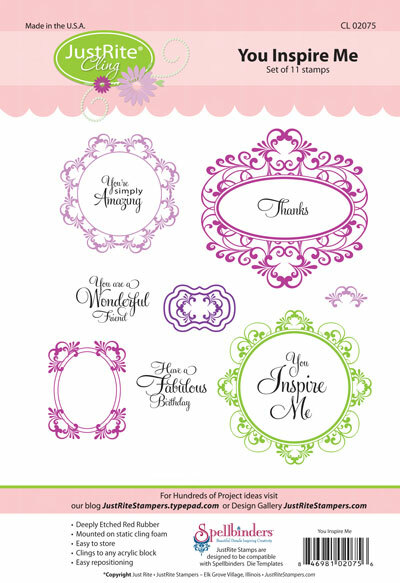 Beautiful and elegant set of cards! Gorgeous designs. Wow!! 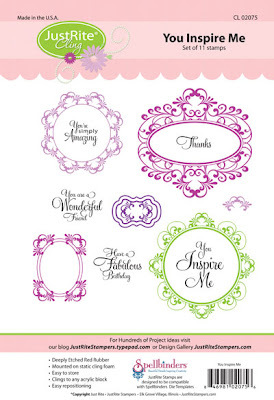 beautiful and elegants cards! !